by Dr. Fabo Feng of the University of Hertfordshire. As humans, we have an innate curiosity about the origins and development of life on Earth. We know that terrestrial life is influenced by the interstellar environment of the Solar System. In fact, there are plenty of studies focused on the effects of supernovae and impact events on the Earth. Some of these phenomena are typically caused by close encounters of stars with the Solar System. Consequently, it is important to study and report such flybys since these events could have played an equivalent roles across the Universe. See some examples of flyby related studies in references1,2,3. Recently, my research has focused on simulating close encounters between stars. In my last work, done in collaboration with Hugh Jones and Tabassum Tanvir, I have simulated the orbits of more than 0.2 million stars using astrometric and radial velocity data from several catalogs (e.g. the Tycho-Gaia Astrometric Solution, TGAS; the Radial Velocity Experiment fifth data release, RAVE DR5; or the Large Sky Area Multi-object Fiber Spectroscopic Telescope second data release, LAMOST DR2, among others). Our results show about 0.2 million encounter pairs and 2760 stellar encounters of planetary systems4. These encounters will have influenced the planetary systems in the same way as the Earth might have been influenced by, for example, mass extinctions. The habitability of Proxima b and any other planets in the Proxima-α Centauri system may also have been influenced by close encounters with other stars. For example, the close flybys of stars could have perturbed some Oort- cloud-like structure and trigger impact events on Proxima b. Assuming a rate of 20 encounters per 1 000 000 years, we have estimated that Proxima Centauri has experienced more than 0.1 million encounters closer than 1 parsec in its life time. Although these encounters are still far from the Proxima-α Centauri system their cumulative effect may have changed the dynamics and habitability of the system significantly5. Figure 1 shows the distances of close stellar encounters to α-Centauri (y-axis is the periastron of the orbit of the pair of stars) compared to the orbit of Proxima (grey area). Time-varying distances from encounters to α-Centauri. The names of encounters and their encounter time are shown in the legend. Thousands of planets have been detected and some planets have been found to be in the habitable zone where they can possibly maintain liquid water in their surface. This has led to a rejuvenation in scientific interest to survey stars in order to identify extraterrestrial life on other planets (e.g. SETI Institute). Furthermore, the fruits of the wealth created by the information age are now starting to be invested in possibilities of interstellar travel and colonization (e.g. Breakthrough Starshot initiative). Interstellar travel and eventual human colonization of these planets will be far more challenging than the Apollo project, and will last for centuries or even thousands of years and require detailed studies of a large sample of nearby planets in order to select appropriate targets to visit. Since the encounter pairs found in this work have/will come closer than 1 parsec typically within 1 000 000 years, it would be more efficient to travel to the stars they will encounter than to nearby stars in terms of the consumption of power and food resources during the travel. The identification of these encounters and detections of potential planets around them would provide a time- varying network of habitable worlds. This network potentially provides the exploration of a route for interstellar colonization. 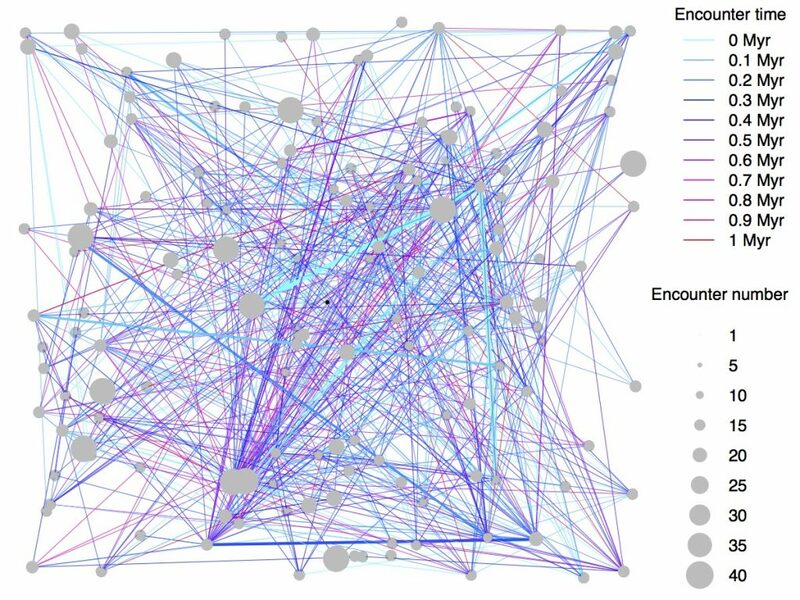 This plot represents a network for interstellar travels. This is the network of stellar encounters in the solar neighborhood. The nodes represent stars less than 10 parsecs from the Sun in the Galactic coordinates. The small black dot at the center denotes the Sun while the grey dots represent nearby stars. The size of a dot is proportional to the number of encounters of a star. The edges connect encounter pairs which will pass each other less than 1 parsec. The width of edge is inversely proportional to the periapsis of encounter pair and the color of edge represents the encounter time. Bailer-Jones, C. A. L. “Close encounters of the stellar kind”, A&A, 575, A35 (2015). Berski, F. & Dybczyński, P. A. “Gliese 710 will pass the Sun even closer. Close approach parameters recalculated based on the first Gaia data release”, A&A, 595, L10, (2016). Mamajek, E. E. et al. “The Closest Known Flyby of a Star to the Solar System”, ApJL, 800, L17 (2015). Feng, F. et al. “A catalogue of close encounter pairs”, submitted to MNRAS (2017). Feng, F. et al. “Was Proxima captured by alpha Centauri A and B?”, submitted to MNRAS (2017). Feng, F. et al. “Agatha: disentangling periodic signals from correlated noise in a periodogram framework”, MNRAS, 470, 4794 (2017). Feng, F. et al. “Evidence for at least three planet candidates orbiting HD20794”, A&A, 605, A103 (2017). Feng, F. et al. “Color Difference Makes a Difference: Four Planet Candidates around τ Ceti”, AJ, 154, 135 (2017). 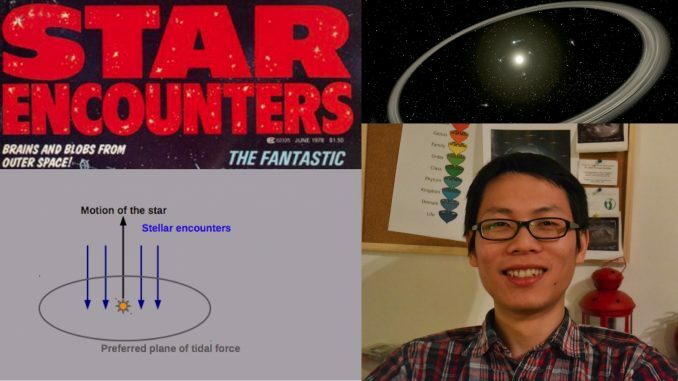 Dr. Fabo Feng got his PhD at the Max-Planck-Institut für Astronomie (Heidelberg, Germany) and he is currently a postdoc fellow working at the University of Hertfordshire (UK). 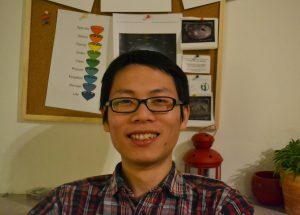 He has developed a framework of periodograms, called Agatha6, to disentangle periodic signals from correlated noise. This software has been used to find the HD 207947 and Tau Ceti8 planets candidates with radial velocity variations as low as 0.4 and 0.3 m/s, respectively.